Upon completion of KM Level 2, students will test into KM Level 3. In this intermediate class students will continue to train on more advanced strikes, defenses against strikes, fall and rolls, self defense, and additional ground fighting techniques. All the techniques learned at Level 1 and 2 will be reviewed with the intention of fine-tuning them as well as properly integrating them with the Level 3 techniques. Students who train two to three times per week should expect to be ready to test for Green Belt in nine months. For us, Level 3 or Green Belt represents the beginning of real mastery of the system. When we test people for advancement to the next belt level, Green Belt is where people start to fail. It is certainly possible to fail a Yellow (Level 1) or Orange Belt (Level 2) test, but as long as the students can fight through the stress, show aggressiveness, and perform techniques adequately, they should pass Yellow and Orange. Green Belt is where you need to bring it all together: You must deal with the stress, be aggressive, AND execute techniques sharply and cleanly. Expect to train at least nine months at this level, assuming a minimum of two training sessions a week. Among the combative techniques covered in this section are headbutts. Green Belt also introduces more traditional martial arts kicks such as slap kick and heel kick. Although we don’t stress these kicks nor emphasize them for street situations, we do believe these techniques improve our self-defense abilities. The kicks encourage flexibility as well as help us learn to defend against these types of attacks. Also, while you should always stick with the simplest and most powerful strikes, these kicks will help you feel that you can at least deliver some kind of attack from any angle during the fight. Hair grab defenses are introduced at this level, and Inside and Outside Defenses are featured more fully here. Outside Defense against Punches are made against attacks from outside our hand position. Although wide attacks (such as the attacks given in 360 Degree Defenses) and even short attacks that travel from the outside inward (such as hook punches) are common attacks to defend, they are not the only ones. Sometimes the defender’s hands are out of position (for example, the left hand is down) when a straight-line attack approaches. If your hands were up, you’d give a regular Inside Defense. But if your hands are down, the more efficient way to defend is to move your hand from the center of your body towards the outside (hence the name). Also, even if your hands were up, sometimes a straight-line attack can come in from an angle (for example, a straight punch coming in from the side), making an Inside Defense difficult. In this case, the shortest movement is an Outside Defense. This level covers both situations: 1) the defender’s hands are down, due to error or fatigue; and 2) the attack comes from an angle outside the defender’s correctly positioned hands. In either case, the principle behind the techniques (indeed, all the techniques) can be summarized this way: Make the shortest possible movement that defends the attack. 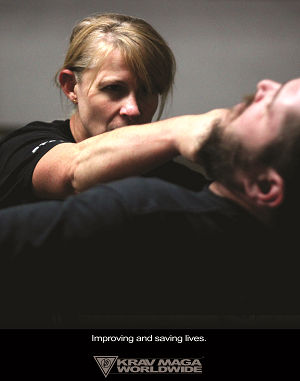 Rolls are important for an overall understanding of self-defense scenarios. During combat, while retreating from a fight or while advancing to help a third party, the defender may trip over an obstacle or be tripped by an opponent. Because we want to get off the ground as quickly as possible, a roll offers the most immediate solution when there is no immediate danger to address. This section picks up where Orange Belt (Level 2) left off. Here you’ll increase the number of techniques in your groundfighting repertoire.